My kitchen looks like it exploded, but that’s okay because I think I’ve found the perfect pecan pie. I’ll post it later. It’s cooling and setting. In between pecan pies, I tried out a quick and easy cookie recipe for Brownie Peanut Butter Cookies. It calls for a full box of brownie mix, but if you have a kitchen scale you can weigh out half the brownie mix and make a half batch.Here’s the recipe. It’s an old Bake-off finalist. 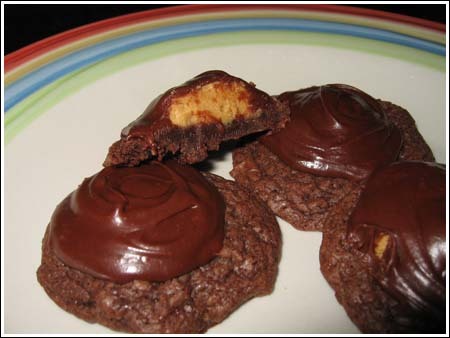 If you like the idea of cookie-shaped brownies, but don’t dig the brownie mix, Cheryl has posted an amazing looking scratch cookie. I agree, but I think they really appeal to kids and taste like reese’s. I don’t measure out the peanut butter and powdered sugar filling anymore, I just add enough sugar to till it gets to the perfect consistency. Happy Thanksgiving! Kelly, I wasn’t crazy about the cookies when I sampled one right after icing. However, a few hours later, they tasted better. The icing had set and all the flavors kind of came together. Or maybe I was just hungrier ;). While I would prefer a scratch version, I loved the concept. Oh, and I thought the filling was too sweet so I used less powdered sugar. This is my sister’s absolute favorite cookie! She begs me to bring them home for her all of the time. I usually make the base with a chocolate cake mix, though. Oh for the Love of GOD could you please post the pecan pie recipe! I am in charge of bringing the pies to my sisters tomorrow!! I had your other pecan pie recipe but if you catch this sooner (before midnight)…it would be so appreciated!! Hubby had me shopping all over town for a pastry blender…he broke the other one we had! So…I have the pastry blender!! Pumpkin pie recipe courtesy of the Libby Can. But your pecan pie recipe would be awesome!!! Oh my gosh!! I just toasted the pecans to make the pecan pie recipe you posted a few days ago. I was excited to make that one, but now I’ll wait for you to post this one and comment on it. As to these cookies. Well, I think my son would LOVE them. So many cookies, so little time! !